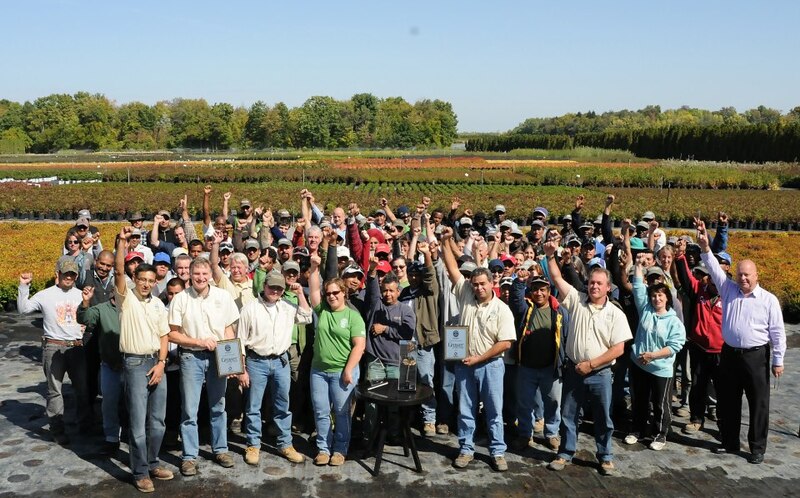 Karl Stensson and his company Sheridan Nurseries have received so many awards during his 40-years of working in the industry that he would need a few helping hands to carry them all. That help is appropriate, as Stensson has provided a great deal of his time, energy and knowledge towards helping improve the industry he loves. Stensson began his work in the family business, Sheridan Nurseries, long before he graduated with his Bachelor of Landscape Architecture degree in 1973. “I began working in the garden centre when I was in grade eight,” he says. After he graduated from the University of Guelph, Stensson didn’t return to the family business. “I wanted to prove that I could make it on my own,” he says. Instead, he was hired by the City of Toronto as a parks planner. After a year there, he went to work for the City of North York as the coordinator of planning and design. “In 1976 I received a call from the family with an offer I couldn’t refuse,” he says. The third generation member of the Stensson family at Sheridan Nurseries moved into the wholesale sales division, later becoming the sales manager. In 1984, Karl Stensson took over management of all Sheridan Garden Centres, landscape supply yards, as well as the landscape design department. He was named President of Sheridan Nurseries in 2009, and became CEO and President in May 2015. Stensson attributes his company’s success to his staff. “We have really good people here – solid people.” That success can be measured worldwide in both business – Sheridan is Canada’s largest chain of garden centres – and in the number of awards garnered by the organization. Sheridan Nurseries received CNLA's national Garden Centre of the Year Award in 2013, 2014 and 2015, followed by two consecutive years as the International Association of Horticultural Producers (AIPH) International Grower of Year. It was the first time that any country won the prestigious award in consecutive years. “This is like winning the Stanley Cup,” said Karl Stensson, president of Sheridan Nurseries, when contacted by Landscape Ontario magazine following the presentation. The company gathered staff members together for a photograph with the Golden Rose Trophy to commemorate the win. Stensson related how the sense of pride was evident throughout staff members, and that even the off-shore workers wanted individual photos so that they could send them back home to family. Sheridan has also won Canada’s Greenest Employers Award, the first Canadian business to win the Operation of the Year at Greenhouse Grower’s Evening of Excellence at Cultivate’15 in Columbus, Ohio, the Ontario Premier's Award for its environmentally friendly storm water management and irrigation system, voted one of Canada’s 50 best managed companies and recipient of numerous Landscape Ontario garden centre awards. From a personal perspective, Karl Stensson is most proud of winning the University of Guelph Alumni Association (UGAA) Alumnus of Honour. The award recognizes alumni whose contributions to the community, science, education, business, industry and the arts are so significant that they bring honour to their alma mater and fellow alumni. The award is generally given for lifetime achievement or sustained commitment to excellence. To view a video on Stensson and the award, go to https://www.youtube.com/watch?v=HLxtdv-EmZ0, and a write-up on Stensson by the University of Guelph at http://www.alumni.uoguelph.ca/stay/stay_profile_stennson.shtml. Stensson is a staunch supporter of his industry’s national and provincial associations, Canadian Landscape Nursery Association and Landscape Ontario and the Canadian Garden Council. He served as president (1979) of Landscape Ontario and the Canadian Garden Council. He is one of only four people to hold the President's Ring from the Canadian Nursery Landscape Association. Over the years, he has received numerous awards recognizing his important contributions to the horticulture industry. These include the Frank Ewald Jr. Award, handed out at the Landscape Ontario Awards of Excellence for outstanding industry contributions from someone under 30 years of age, and the Trillium Award for outstanding support of the horticultural industry and Landscape Ontario and an honorary life membership. Stensson holds the distinction of being the only person to receive every major award bestowed by the Canadian horticulture industry. He continues to serve as the chair of Landscape Ontario building committee. A position he has held since 2006. In 2016, that committee is looking at plans that will have a major influence on the future of Landscape Ontario. Following the sale of 24 vacant acres of the LO home office 48-acre property in Milton for over $9-million, plans call for major renovation and construction of offices and school facilities. He also recalls a major move during his presidency when it was decided that the association would purchase its own building. “We were paying a large amount for rent. An opportunity came along to purchase a building near the airport, and we determined that the mortgage was less than the rent.” The present property was purchased in 1994. In May 1911, two British landscape architects Howard Dunington-Grubb and his wife Lorrie opened one of Canada’s first landscape architecture firms in Toronto. They soon found out there was a lack of locally-grown ornamental plant material. In 1913, the couple purchased 100 acres near the village of Sheridan (now part of Oakville), named after the Irish playwright Richard Sheridan. A young Swedish-born nurseryman, Herman Stensson, and his wife and four young sons came to Canada to establish this new nursery in the spring of 1914. A daughter, Betty born in Canada a few years later, completed the family. By 1926, the nursery had grown to 250 acres with an extensive selection of trees, shrubs, evergreens, roses and perennials. The company continued to grow through the war and post war years when farms were added north of Georgetown. Herman Stensson died in 1938. His oldest son J.V (Bill) Stensson took over as nursery manager, and his three brother’s Fred, Chris and Howard and a sister Betty all worked for most of their careers for Sheridan Nurseries. Today, Herman’s grandchildren, Bill and Karl Stensson, continue the family operation. With eight garden centres, Sheridan Nurseries is now the largest garden centre retailer, including over 1,000 acres of land in its nursery operation. Stensson was on the cutting edge by turning garden centre retail shopping into a sensual experience. He refers to consumers not as customers, but as guests. Christmas trees and ornaments have become a big success for Sheridan. “December is now our fourth or fifth largest month in sales, depending on the weather.” The garden centres also added medium- to high-end gift shops. “We were one of the first garden centres to begin selling non-horticultural products by bringing in patio furniture. Most of our guests are female, so now we have a large selection of fashion items. They represent 75 per cent of our customers and they are the decision-makers.” He says, “Our industry needs to understand that people want to see and touch our products. No doubt, Karl Stensson will continue to serve and lead his business and industry with passion and dedication.